Evie Richards stormed to victory in the inaugural U23 Women’s Race and become our first world champ in CX since Roger Hammond; having also won a silver medalists for the MTB worlds last year. ​For those who have seen her at the National Trophy races this season you will know her for that famous podium hat and huge friendly smile. She has some words here that are interesting, inspiring and encouraging to all. Tell us about the CX Worlds? I’m not sure where to start. I can't even remember much of the race even though it was only a week ago because I was in the zone like I had never been before! The crowds were amazing; I had never experienced an atmosphere like it. From when I crossed the line to that night was just a whirl wind, I went straight from the race into a live interview, to the podium to another interview, into drugs testing and then into a crowd of people who wanted a picture with me! I was very privileged to be selected to race in the worlds as it was my first international cross race, so some people could have seen me as a risk. I was so lucky to have my family there who could experience it all with me. It was truly amazing hearing so many kind messages after the race, I just couldn't believe they were all to me! Did you think the rainbow jersey could be yours before the start? I really wanted a top 5, but it was so hard for me to gauge where I would come as the field was so open, so I even thought that might have been a push. When I was doing a faster practise lap, my bike felt amazing and so did my legs and just for one minute I thought imagine if I won, but then the last time I thought about winning I had my worst race, so I changed subject in my head very quickly! When and where did you start cycling [as a sport] and what inspired you? I was advised to pick up another sport from my regional hockey coach, my dad had a ride to work scheme bike and I thought that riding would be a great chance to spend time with him and build my fitness. I soon fell in love with riding and joined Malvern Cycle sport, which was so supportive and I loved every aspect of it. I stated racing in local go ride races, such as Top Barn and entered local races such as Tracy Moseys race at Storridge. What came first, a love of riding your bike or a desire to race? It was defiantly the love of riding, I hated racing as I would get so nervous, I was nearly sick before the start of any race I did. It has only been in the last couple of months I have fallen in love with racing. I think I use to put so much pressure on myself, it was always the fear of failure. Now with a training programme and race experience, when I line up at the start line, I know how much work I have put in, so getting nervous on the day won't change anything. I think about it a bit like an exam, if you have done lots of revision, your exam result will be the best it can be, this helps me control my nerves. Who are your cycling hero's; one female and one male would be lovely? This is so easy for me! Tracy Moseley and Liam Killeen are my cycling hero’s, and I am lucky enough to train with them, go for a coffee with them and drop them a text whenever I like! They have both achieved so much in their cycling careers, they have both faced barriers in their disciplines, with Liam facing injury and Tracy facing barriers in relations to enduro not being recognised by British cycling and they both have so much time for other ridings and putting time into up and coming athletes. Not to mention that they are both lovely people. What one thing would you change to improve youth bike racing? I would be riding! I wasn't riding a bike when was a youth, so just starting earlier would be a great place for me to start! What do you do when not out on your bike? Although I don't mind getting muddy on the bike, or getting oil all over my legs (as I am known for this!) I am a girly girl. I am very close to my family and especially my sisters, so I love shopping with them, going out for meals and or just sitting in my pj’s all day and talking with them! My best friends are the 4 boys I ride my bike with, so off the bike we like making bonfires, setting off fireworks and digging tracks. We also love a good cafe ride for breakfast. What top tips would you give that may inspire young racing cyclists? I think it’s always important to get the right balance between life on and off the bike. Last year I got 2nd at MTB worlds, looking back I could of changed some of my training to get a 1st place, but for me having fun which was my main target last year was so important and the result was just be a bonus. If you could have only one bike, what would it be and why? I think the colour is very important, with all 4 of my Trek bikes last year being a different colour from bright orange to baby blue. If I was only allowed one bike I would have a Cath Kidson flowery Trek Cyclocross bike (although this bike doesn't exist ..... yet). I would have a cross bike as you can ride them anywhere because the frame is ridge and light so you can get good miles done on the road, but the grippy tyres mean you can descend down most MTB trials, if you hold on tight! I would have a trek, as I have always loved the shape and colour that they design. 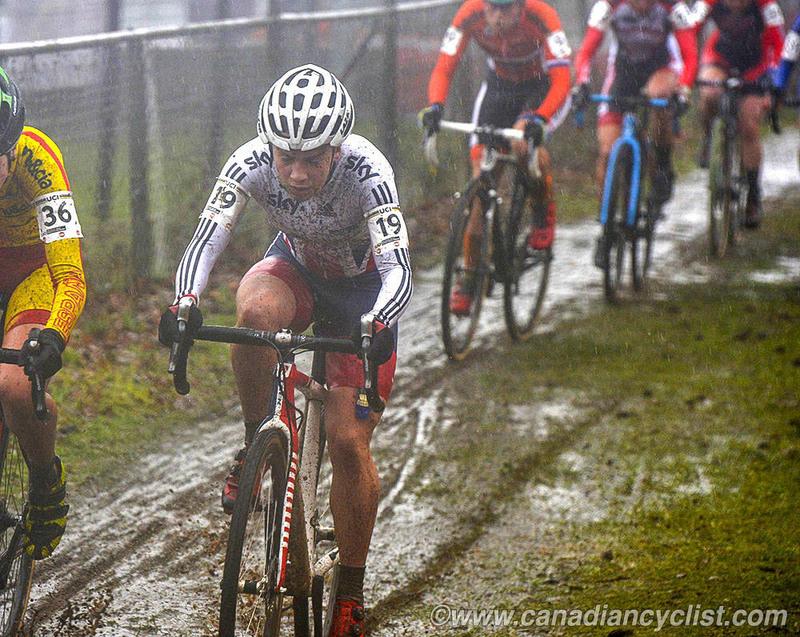 What is your greatest strength and biggest weakness on a CX bike (we promise not to tell the Belgium's)?! I would say my biggest strength is running! I come from a background of doing hockey and cross country running, so I just love steep running sections. I have so many weaknesses as I am so new to cross, but watching my race back from the weekend it would have to be dismounting and carrying the bike, In the race I remember running up the sandy bank on one lap, the pedal got in the way to I just dragged the bike by the top tube, which is not the way it should be done! Is there anything particular you would say about cycle sport when chatting to young women who will now see you as a huge inspiration? Just always make sure you are enjoying yourself. Ride your bike because you love being on it. Make sure you always stay true to yourself, an example is before I race I wear perfume, some people might say its stupid, but smelling good puts me in a good mood on the start line so I will always do it!